SAN FRANCISCO--(BUSINESS WIRE)--Sep. 3, 2014-- Please replace the release with the following corrected version due to multiple revisions. Visa Inc. (NYSE:V), the global leader in payments, is teaming up with top retailers and financial institutions to give NFL fans an easier way to pay online during the 2014 NFL season. Using Visa Checkout, consumers can pay online and on any mobile device, in just a few clicks. In support of Visa Checkout, the company today unveiled a multi-million dollar North American consumer marketing blitz. The campaign will include national television and digital advertising, social engagement programs, retailer promotions, and client activation programs, each designed to highlight the simplicity and utility of the new Visa Checkout offering. This first-ever national Visa Checkout campaign kicks off today, alongside the 2014 NFL season, incorporating a broad suite of compelling, original content. Footballentine’s Day: The Easier Way to Say Thank you! Recognizing how dedicated NFL fans are to their teams throughout the season, Visa Checkout is making it easier to say thank you to friends, family and loved ones for supporting their “fandom” during football season by celebrating a new holiday - Footballentine’s Day - on Sept. 6. Just in time for the holiday, Visa is giving fans the opportunity to send 18 roses from 1-800-FLOWERS.COM to loved ones, for free by visiting visacheckout.com/flowers. Customers just pay shipping and applicable taxes. Fans that enroll in and use Visa Checkout can place an order for 18 free roses from 1-800-FLOWERS.COM and only pay shipping and applicable taxes. Free roses orders must be placed by Friday, Sept. 5, at 4 p.m. EDT while supplies last. 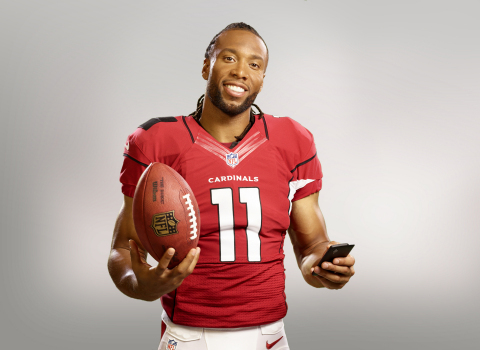 “One-Handed Catch” features eight-time Pro Bowler Arizona Cardinals wide receiver Larry Fitzgerald using Visa Checkout to pay on his mobile phone, while simultaneously fielding passes from three of the NFL’s most celebrated quarterbacks: New Orleans Saints’ Drew Brees, San Francisco 49ers’ Colin Kaepernick and Indianapolis Colts’ Andrew Luck. This new spot will air on Sunday, Sept. 14 as part of FOX broadcast of the first Sunday of the NFL regular season. Visa Checkout is designed to help make shopping online as simple as it to “swipe” with a Visa card in stores. Visa Checkout also preserves whatever liability protections and rewards programs your payment card offers, as well as the real-time fraud monitoring. The prestigious list of online merchants that accept Visa Checkout continues to grow, and as of today includes Neiman Marcus, Staples, Petco and 1-800-FLOWERS.COM. Consumers can sign up for Visa Checkout through any participating merchant or bank websites, or at www.visacheckout.com. As an NFL sponsor since 1995, Visa is the exclusive payment services sponsor of the NFL league, as well as team sponsors of the Arizona Cardinals, Atlanta Falcons, Baltimore Ravens, Buffalo Bills, Carolina Panthers, Denver Broncos, Indianapolis Colts, Minnesota Vikings, New England Patriots, New Orleans Saints, Pittsburgh Steelers and San Francisco 49ers. As the proud sponsor of 12 NFL teams, Visa is the preferred card for ticket sales, concessions and merchandise and will have point-of-sale branding online and at all team payment terminals within the stadiums, including concession areas and team shops. Visa is a global payments technology company that connects consumers, businesses, financial institutions, and governments in more than 200 countries and territories to fast, secure and reliable electronic payments. We operate one of the world’s most advanced processing networks - VisaNet - that is capable of handling more than 47,000 transaction messages a second, with fraud protection for consumers and assured payment for merchants. Visa is not a bank and does not issue cards, extend credit or set rates and fees for consumers. Visa’s innovations, however, enable its financial institution customers to offer consumers more choices: pay now with debit, ahead of time with prepaid or later with credit products.